Our famous version of worlds most powerful 225cc kit for 200cc Lambrettas. As with all TS1 kits, the cylinder is aluminum alloy with a nikasil plated bore, which provides optimum heat transfer and drastically reduces the chance of piston seizure. Porting includes an integral reed valve intake, five transfer ports, and a single exhaust port. A GP200 or SX200 cylinder head is required, and it must have the squish band reprofiled to match the new 70mm bore. What sets the Humiliator apart is its bulletproof Wiseco forged piston and Yamaha connecting rod with larger 18mm wrist pin bearing. This combination improves on the performance of a standard TS1 kit by optimizing the cylinders port timings, at the same time improving reliability thanks to the incredible strength of the forged piston and the nearly indestructible rod and bearing combination of the Yamaha rod kit. The rod kit will fit any GP crank with a 22mm big end pin, which includes SIL cranks, AF Rayspeed race cranks, and some aftermarket Italian cranks with a 22mm big end pin. It will not fit original Innocenti or Mazzuchelli brand crankshafts (which have a 22.9mm big end pin) unless a specially machined pin is used which is 22.9mm on each end and 22mm in the center where the bearing rides. A 35mm flat slide Mikuni TMX carburator (WCLW #0455.AKTS1) is your best choice for maximum power output. The carb is relocated to the right hand (kickstart) side of the engine compartment, and scooters with a battery will need to have the battery tray cut off and relocated to the opposite side of the frame. 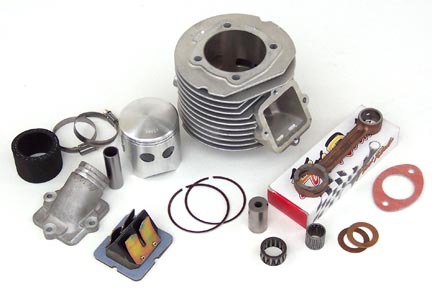 The cylinder kit includes the cylinder, Wiseco piston with two rings, wrist pin, and circlips, reed valve assembly, intake manifold, Yamaha 116mm rod kit, hardware, and all gaskets. As with all high performance conversions, make sure your clutch, transmission, and all bearings and seals are in top condition, and the Humiliator will not let you down as it unleashes its fury on its unsuspecting victims!